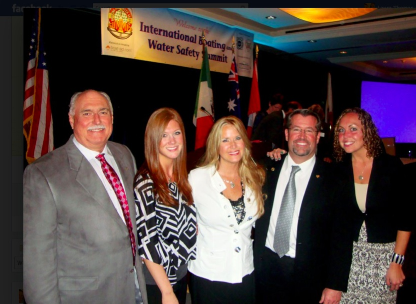 San Diego, CA–On March 7th, 2012–Blake and Kathy Collingsworth were awarded the 2012 National Water Safety Congress Regional Award for their water safety efforts with Josh the Otter and Float4Life in NWSC’s Region Two area. The NWSC also signed a Memorandum of Understanding with JCMF to establish a long-standing partnership in water and boating safety. 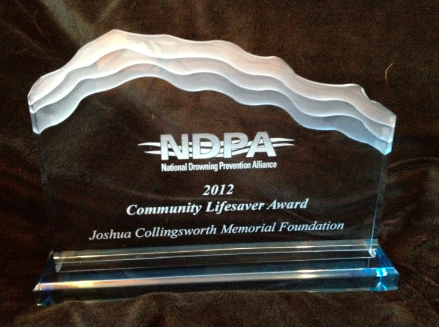 San Diego, CA — On March 9th, 2012 the Joshua Collingsworth Memorial Foundation (JCMF) received the 2012 Community Lifesaving Award from the National Drowning Prevention Alliance (NDPA) at the 11th Annual NDPA Symposium attended by over 200 Aquatics and Child Safety professionals from around the world. They were awarded this honor due to their regional work in drowning prevention awareness and early childhood water safety education. In 2009 the Joshua Collingsworth Memorial Foundation was awarded the Harris Van Ort Friends of Children Award for funding the renovation of the Nebraska Children’s Home Society’s Lincoln, NE facility, which enabled the NCHS to offer post-adoption services to families in need. The new addition was named the NCHS Joshua Collingsworth Center. In 2010, the Joshua Collingsworth Memorial Foundation was awarded The Bradley L. Cuda Memorial Award for their extensive work in spreading water safety education to young children across Nebraska’s Lancaster County. The Bradley L. Cuda Memorial Award was established in 1985 and is presented annually to recognize those individuals or organizations who have made a significant contribution to child safety in Lancaster County. The REALTORS® Association of Lincoln looks for individuals within the community who believe teaching young children how to be safe is a vital part of growing up. 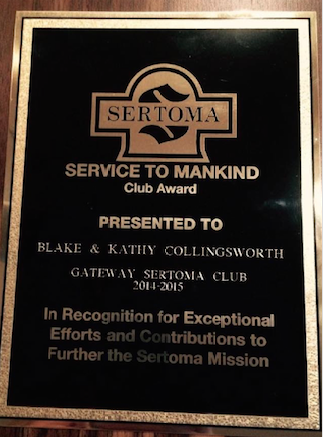 The award is presented each May. On August 21 of 2010, the Joshua Collingsworth Memorial Foundaiton was awarded by the Rotary International, Rotary Club of Indialantic, Florida for our continued Efforts In Teaching & Promoting Water Safety To Our Children through the Josh the Otter Water Safety & Awareness Project. April 29th 2010 Joshua’s foundation created a children’s area in the Matt Talbot Kitchen and Outreach Center, located in Lincoln Ne, helping to facilitate the children of the homeless and families in need. 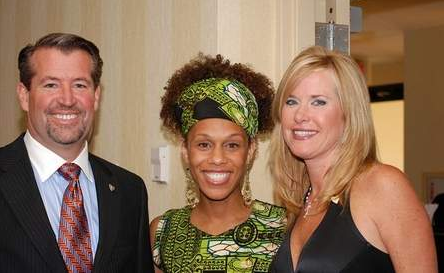 In April of 2011, the Joshua Collingsworth Memorial Foundation gave six scholarships to Omaha, NE children that could not afford to go to summer camp. The summer camp will include multiple forms of enrichment but most importantly, the children will learn how to swim & be safe in water! The program will include healthy meals, providing swimming suits, swim certification classes, and free transportation throughout the summer program. St. Michael’s Church new kindergarten classroom in Lincoln, NE will be named in honor of Joshua. The foundation was honored for its help in the funding of the kindergarten class room, interior design, materials, and class room desks. 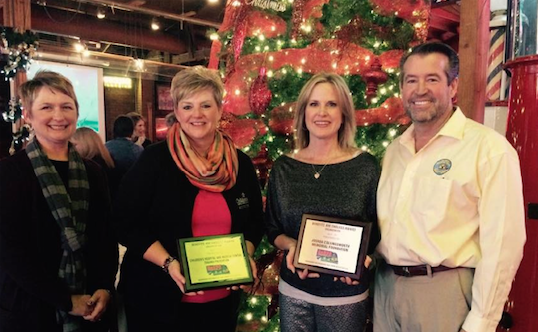 In 2009, the Joshua Collingsworth Memorial Foundation was honored for their service and financial support in funding the infant & toddler water training classes at the Lincoln YMCAs. The program is called Float 4 Life and is rapidly expanding across Nebraska and Wisconsin.